The ‘Unhackable’ BitFi Cryptocurrency Wallet: Recently, there has been a lot of hype about the John McAfee’s claim for his ‘unhackable’ BitFi cryptocurrency wallet. Amidst so many incidents of crypto hacking, making such a claim is indeed a bold step. The ‘Unhackable’ BitFi Cryptocurrency Wallet – Is It Truly Unhackable? He has clearly refuted the popular paradigm “nothing is unhackable”, and has challenged the hackers from around the world to hack BitFi and steal the bitcoins. After his challenge, several ethical hackers came up with the claim to have hacked the wallet. Yet, neither BitFi nor McAfee confirmed their claims. After hearing about so many “hacked” and “no hack” claims for this BitFi thing, today, we decided to scratch the surface. BitFi Cryptocurrency Wallet – What Is It All About? 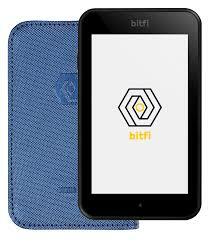 BitFi wallet, just like any other cryptocurrency wallet, is a digital device to let the users store their crypto assets safely. Yet, the difference lies in its peculiar functioning. Those who are actively involved in crypto know that the wallets somehow store the private keys with them. While storing private keys prevents the need to store them elsewhere, this still poses a cybersecurity risk to your crypto assets. However, a quick vulnerability assessment of the wallet will show that it stores nothing hackable. Especially, it does not store your private key. Whatever private key you use for the wallet will remain only in the user’s mind, and nowhere else. Moreover, it does not require any separate pin-code or mnemonic seed for recovery. A couple of weeks ago, John McAfee announced $100,000 bounty for anyone who successfully hacks the BitFi wallet and takes the coins. (The BitFi wallet comes with preloaded BTC 50 that are available with an additional charge of $10 after purchase.) After some time, the prize money was raised to $250,000 for ‘everyone’ who hacks the wallet. The rules for the hack are simple – the hacker simply has to empty the wallet through whatever procedure they employ. Once done and proven, BitFi will pay $250K to the successful hacker(s). For this, BitFi clearly allows everyone participating in the program to exploit their resources. The reason behind this open challenge appears simple. John McAfee says the wallet is stores nothing hackable. Hence, even after accessing the device, no one could ever steal the crypto stored in it. Things were seemingly fine until the $100K (later raised to $250K) bounty announced for hacking BitFi. Several hackers appeared online, claiming to have accessed the wallet. Yet, BitFi and McAfee clearly deny the rumors. In the past week, the media literally claimed that BitFi has been ‘hacked’ after several researchers put up their claims one-by-one. The one by OverSoft was given the most coverage. However, McAfee clearly refutes the claim, saying that the bounty actually revolves around a successful hack whilst stealing the bitcoins. Perhaps, this is what they have been explaining from day-1 – the hacker has to empty the wallet to claim a successful hack eligible for the bounty. Interestingly, despite several claims for hacks, none of the hackers has claimed to take away the bitcoins yet. Considering this aspect, one can believe BitFi’s claim to be unhackable. Nonetheless, apart from this debate, BitFi has also announced a second bounty, that is indeed a bug bounty program. In this program, they are offering $10,000 as bounty for identifying flaws in the wallet. Perhaps, those who are trying to win the $250K bounty may eventually end up winning $10K (maybe!). However, the launch of a second bug bounty program in the middle of the heated “unhackable?” debate may be a step to further strengthen their security to remain “unhackable”. There are few certainties in life. One of these is that everything is hackerable. It’s just a question of skills, time and resources. Whether BitFi is hackable or not, one thing is for sure. They have successfully created a ripple in the cybersecurity as well as the marketing worlds involving several hackers and the media. Let’s see where this heated debate goes in the days to come!